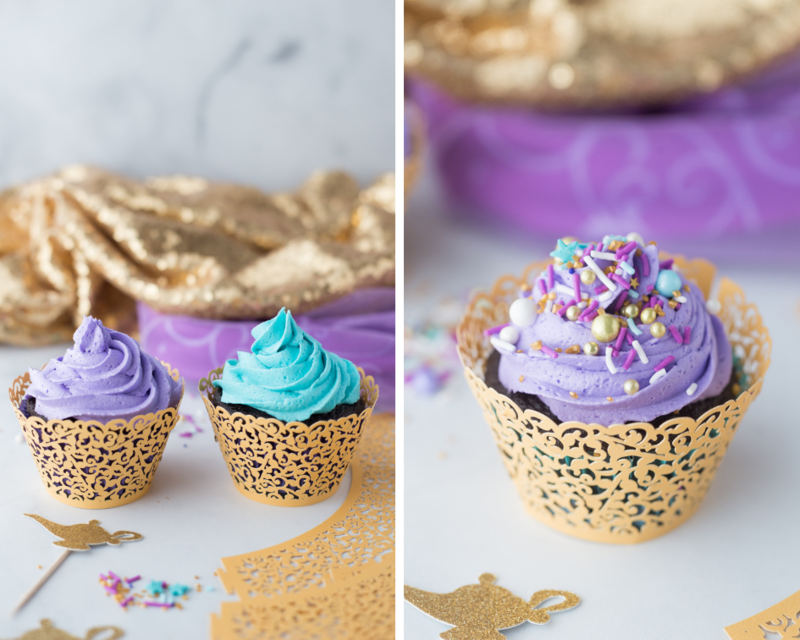 DIY Aladdin Cupcakes: a fun and simple cupcake perfect to celebrate any Princess Jasmine or Aladdin party! One of my all time favorite Disney princess movies has always been Aladdin so you can image how excited I am to see the new live action Aladdin movie. My daughter loves all princess movies and it’s been so fun watching all the classics with her. 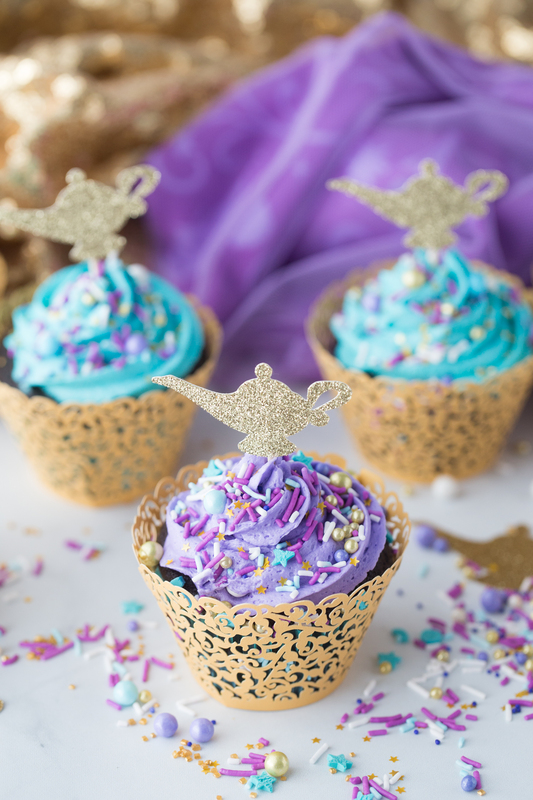 These Aladdin cupcakes were a food treat we had fun creating on a Saturday after we watched the movie. Just like our Belle Cupcakes and our Little Mermaid Cupcakes, they are easy and perfect for any kind of a princess party! Genie Lamp Shapes, cut with Silhouette or Cricut machine. Add your sprinkles to the top of the cupcakes. 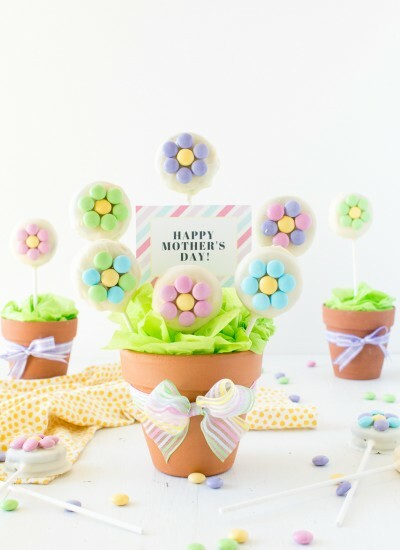 Add your cupcake wrappers and your genie lamp cupcake toppers. 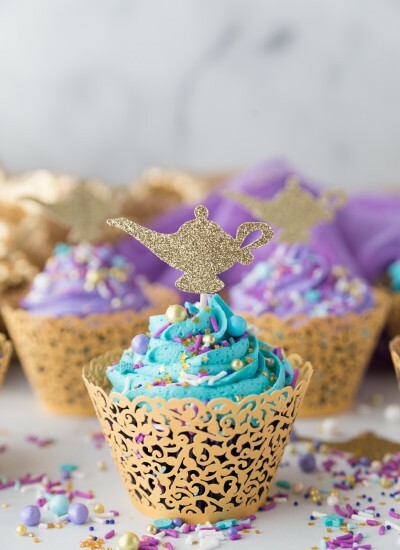 Where can I find the Special Elements added to these Aladdin Cupcakes? 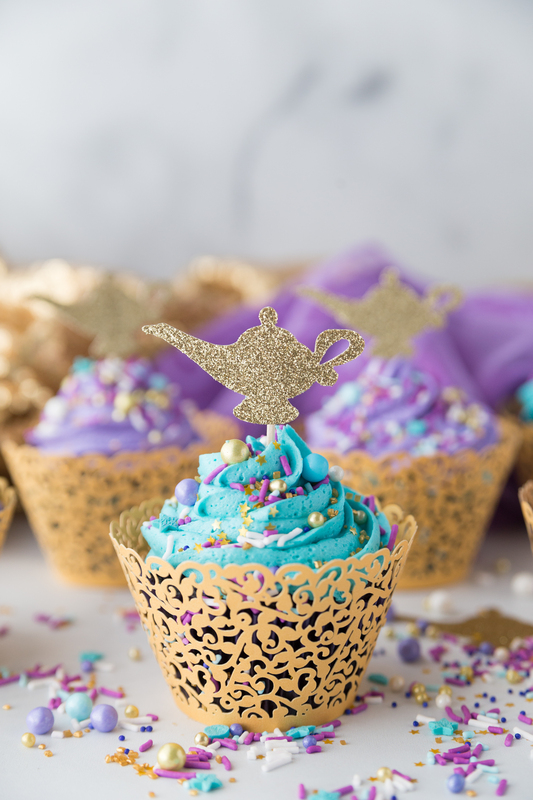 Most of the supplies needed for these simple DIY Aladdin cupcakes can be found at any craft store or online. 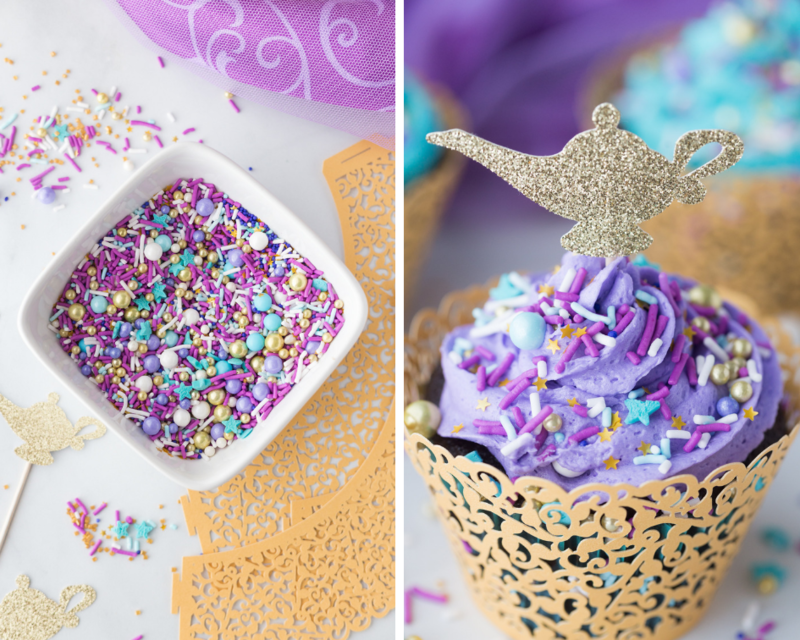 Some of my favorite elements to these Aladdin cupcakes are the cupcake wrappers, the sprinkles and the Genie Lamps. All three of those elements complement each other so well and really give the cupcakes a “finished” look. The Fairy Tale Sprinkles I purchased were from Etsy and while they are definitely pricier than regular sprinkles they really add that perfect Arabian Aladdin Feel. I made 24 cupcakes and only used 1/3 of the container of sprinkles. 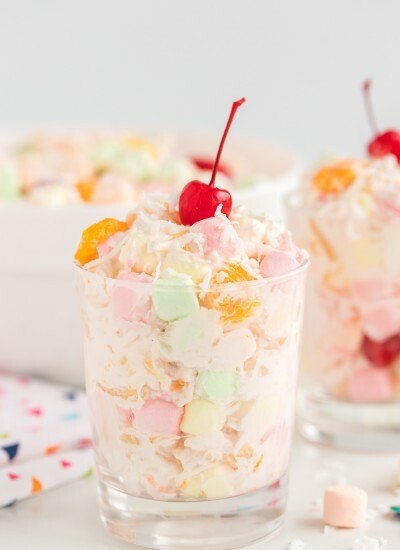 So you will have plenty left over for future treats and parties. 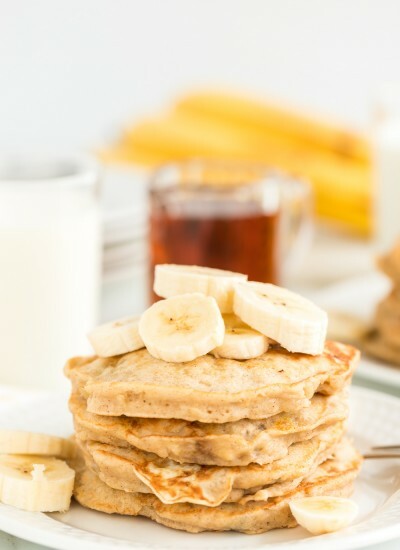 The gold cupcake wrappers – again, these are of course optional but I love the pop of gold they give to these cupcakes. They are simple to wrap around the cupcake and we wrapped them around an already lined cupcake which meant we were able to save the gold cupcake wrappers to use again. 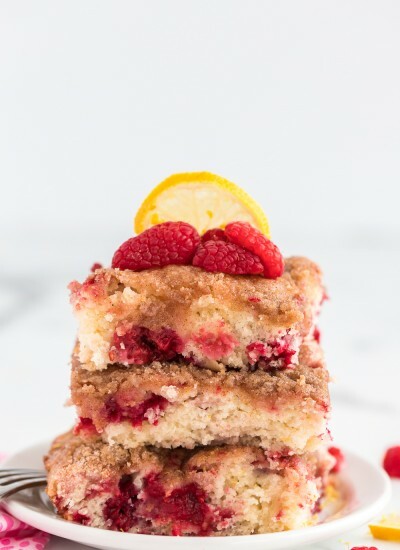 They are great for all kind of occasions, weddings, bridal showers, Thanksgiving dinner. Genie Lamp Cupcake toppers- these cupcake toppers really took these cupcakes from “they are so pretty” to “YEP! 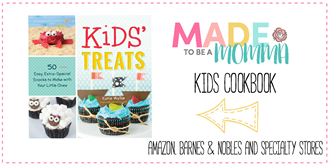 That’s an Aladdin cupcake”…which is exactly what we wanted! There are so many svg files you can find for genie lamps so if you have a cutting machine, such as a Cricut or a Silhouette machine, this part should be pretty easy to replicate. I cut my genie lamps out of a pretty glitter gold piece of scrapbooking paper and attached it to a toothpick. Then I just inserted it into the cupcake.